Time to discuss one of my biggest missed opportunities of 2013: Hennessy Advisors. In late 2012, Hennessey completed a transformational acquisition that was highly likely to increase the company’s earnings and share price, which was then hovering around $3. I looked into the projected earnings (though perhaps not as thoroughly as I should have), even read a nicely-written summary that was circulating in the value investing community, and then did absolutely nothing. Imagine my chagrin to see the company rise and rise to its current level around $12 on the basis of greatly improved earnings and a bright outlook. So why choose to discuss Hennessy Advisors? As worthwhile as conducting post mortems on one’s missed opportunities can be, I know most readers drop by my humble blog for profiles of interesting and obscure companies that may offer strong investment potential. Despite Hennessy’s strong run since late 2012, I view Hennessy Advisors as under-valued and yet to achieve a fair valuation, based on its extremely attractive business model and operational momentum. First, a little history. At the end of 2005, Hennessy had $1.83 billion under management, and earned 53 cents per share in the fiscal year ended September 30, 2005. Earnings would move higher for the next two years, but assets under management peaked at $2.25 billion in early 2006 before beginning a steep decline. Investors began to withdraw their funds in the third quarter of 2007 as the severity of the economy’s troubles came into focus. From then through the first quarter of 2009, Hennessy’s woes were compounded by investment losses in its funds of $725 million. From there, the company’s funds began to reverse their investment losses, but the damage was done. From the end of 2005 to June 30, 2012, Hennessy’s investors withdrew a total of $1.22 billion. Despite positive investment returns of $47 million through the entire period and purchasing funds with another $233 in assets under management, Hennessy’s assets under management were cut by more than half to just $821 million. Hennessy’s earnings and stock price had plummeted from their 2006 highs, but the company hatched an idea. In late June, 2012, Hennessy announced it would acquire the FBR family of mutual funds. The ten FBR funds had $1.9 billion in client assets, which would immediately more than triple Hennessy’s managed assets. The price of the acquisition was projected to be $28.75 million, with 60% to be paid up front and the remainder to be paid on the first anniversary of the deal’s close. The price of the remaining 40% would be calculated on the assets under management at that point. Hennessy funded the purchase price mainly through a line of credit. The deal closed on October 26, 2012. By then, strong investment returns had lead the value of the FBR funds to rise to $2.22 billion. Hennessy folded three of the former FBR funds into existing Hennessy funds, and renamed the other seven. With its new, expanded pool of assets under management, Hennessy’s profits increased and its stock was off to the races. Since the transaction closed, Hennessy has continued to add to its assets under management through market appreciation and through investor inflows. Assets under management surpassed $4 billion for the first time at quarter’s end. While the FBR funds purchase is the major contributor to Hennessy’s AUM growth over the last year, the company has also enjoyed market appreciation in its funds of $649 million. Retail investors (ever buying high and selling low) have began piling back into equity funds, making Hennessy’s funds the recipients of a net $243 million in the same time period. Hennessy’s $4 billion in assets under management are divided among 16 different mutual fund offerings, but two funds purchased from FBR account for over half of these assets. Each of the two funds has an outstanding long-term track record and excellent recent performance, which has driven investor inflows. The Hennessy Focus Fund has exceeded other funds in its category by 3.00% annually for the past ten years. The Fund has been sub-advised by Broad Run Investment Management, LLC since 2009. The fund’s AUM increased 68.1% from October 31, 2012 to October 31, 2013 on the strength of strong investment returns and high inflows. The Hennessy Gas Utility Index Fund has exceeded other funds in its category by 3.01% annually for the past ten years. 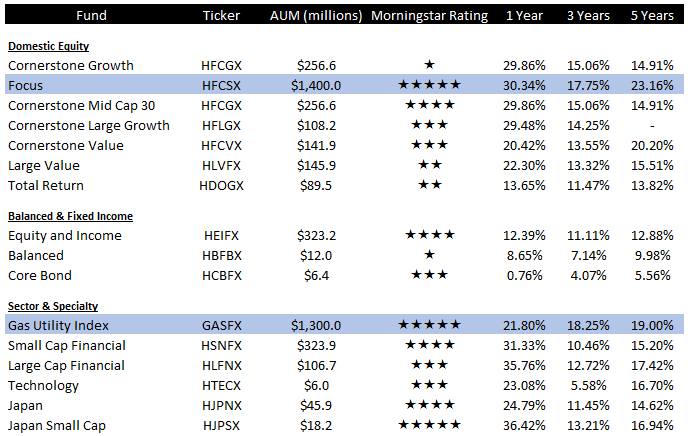 Morningstar ranks the fund number 1 in its category for the 3 and 5 year trailing periods. Of course, a mutual fund’s good historical performance is no indication of superior future returns. However, a good track record (especially strong recent performance) is a powerful marketing advantage, and mutual funds distribution is all about marketing. A very large cohort of investors select mutual funds investments on the basis of performance alone. The fact that Hennessy’s two flagship funds have performed so well will help keep shareholder funds rolling in. Hennessy’s results since the acquisition of the FBR funds show just how transformational the purchase was for Hennessy. Fourth quarter 2013 operating income rose nearly fivefold from fourth quarter 2012 results. Strong as the most recently reported quarter was, there is ample reason to believe the first quarter of fiscal 2014 will be even better. Since September 30, 2013, the S&P 500 Index has risen 10% and investors have continued to pour new money into equity funds. Luckily for us, Hennessy explicitly discloses the management fees it receives for each of its funds. 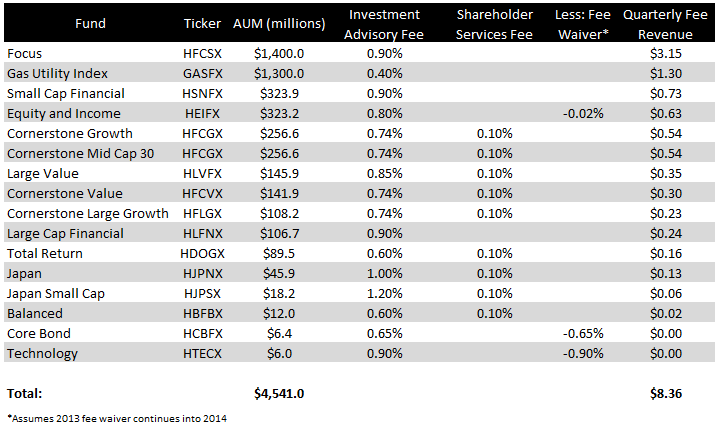 Using Morningstar estimates of assets under management in each fund, we can predict Hennessy’s quarterly revenues. Because of continued market appreciation and investor inflows, Hennessy’s revenues will likely increase by more than 15% in the first quarter of fiscal 2014. This figure excludes revenue from 12B-1 fees, because the company does not disclose enough information to estimate them accurately. But it’s not all positive news. Hennessy’s operating expenses will rise as well. Several of the company’s funds are sub-advised, and those sub-advisory fees will rise as AUM grows. Hennessy discloses these fees as well. When Hennessy Advisors reports its first quarter results, sub-advisory fees will likely rise over 17% from the previous quarter’s $1.17 million. Other operating expenses are less certain, but conservatively assuming 10% increases in each category still results in a 24.30% increase in operating income. Once operating income has been projected, projecting net income is only a matter of deducting interest expense and taxes. In in the 2013 annual report, the company revealed it had paid the remaining 40% purchase price for the FBR funds in November. The price was $19.19 million, $13.29 million of which Hennessey funded using a loan. Hennessey’s total debt is now $36.06 million, bearing interest at 4.00%. Hennessy’s effective tax rate has hovered around 40%. The chart below shows projected annualized results based on projected first quarter 2014 figures. At its current level of assets under management, Hennessy could earn $7.49 million over the next year, or $1.29 per share. This figure does not include the effects of continued inflows or potential market appreciation. If these trends continue, earnings per share could go much higher. Investor inflows in particular are likely to continue as strong recent performance for the Focus and Gas Utility Index funds draws attention. Retail appetite for mutual funds tends to lag market movements, which suggests that equity fund inflows will continue in the short run. At its current price, Hennessy Advisors trades at 7.62 times my estimate of forward EBIT and 9.35 times forward earnings. Once again, these estimates are conservative and do not include the effects of market appreciation or continued inflows. The chance to buy an asset management company at under ten times earnings is rare. Because the asset management business model is so attractive, asset managers rarely trade a so cheaply. Consider how many other businesses have the opportunity to grow revenues in the high single digits annually simply through market growth, and require practically no additional capital to do so? A look at Hennessy’s publicly-traded competitors shows just how under-valued Hennessy appears to be in comparison. 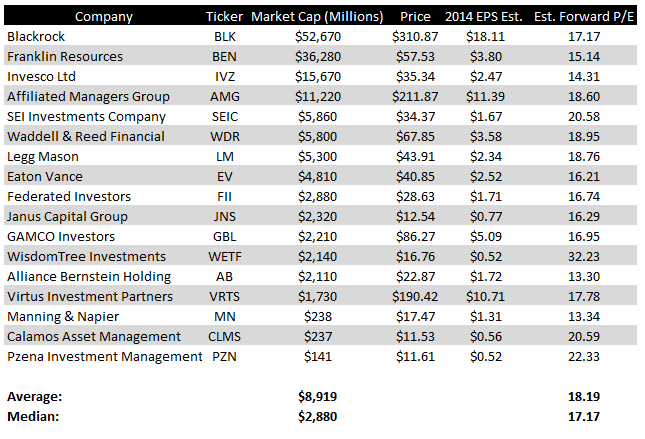 The chart below shows forward valuations for all the US asset managers for which I could find 2014 earnings estimates. Using my conservative earnings estimate, Hennessy trades at a 50% discount to peer valuations. None of these risks are unique to Hennessy, so I see no reason why the company ought to remain so cheap compared to competitors. Perhaps a small discount for Hennessy’s small size and concentrated fund portfolio is warranted, but not 50%. As Hennessy’s AUM and earnings grow, investors could see Hennessy’s stock appreciate to more reasonable levels. Great write up on a company I have been thrilled to own over the last 15 months. A couple of minor suggestions. 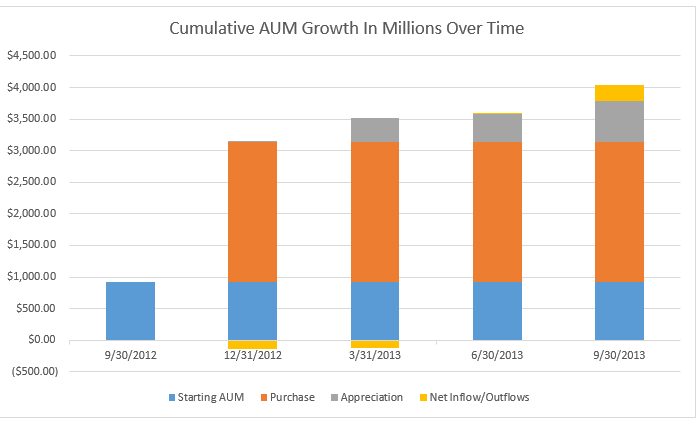 Your quarterly estimates seemed to use quarter end AUM figures. I use quarterly average AUM, which I think would be better. In the December quarter your estimate may be about 5% too high ($$4.5 bn AUM vs. $4.25 bn). Your total debt figure appears to be actual debt at September plus the 40% due on the management contract. Some of that was paid in cash so total debt is lower than $36 million. Lastly you did not include the deferred taxes benefit. Hennessy can amortize the purchase price of the funds over 20 years. This means they have additional depreciation for tax purposes. The net effect was $1.3 million in the last 12 months. The amortizable figure will increase due to the remaining $19 million purchase payment. If I understand correctly that means another $1 million annual amortization expenses for taxes which will further reduce actual tax expense by another $350,000 or so. In other words cash earnings are about $1.5 million more than reported, which is another $0.25 per share. Disclosure: I am an RIA and accounts and a fund I manage own over 1% of HNNA. Great points, and thanks for the additional clarifications. You are correct about the debt figure. I should have deducted the cash portion paid. The difference will result in increase EPS of around 3 cents over the next year. Also, I was unaware that purchase price could be amortized. That’s a huge tax benefit that will increase earnings materially! In case anyone is confused. 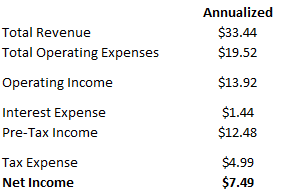 Hennessy’s income statement shows the full tax rate (before amortization of the management contract). The cash flow statement shows the effect of the amortization as Deferred Taxes. Thus cash earnings for fiscal 2013 are $1.3 million, or $0.23 per share higher than reported earnings. In 2014 cash earnings will be $0.27 to $0.33 higher than reported earnings. 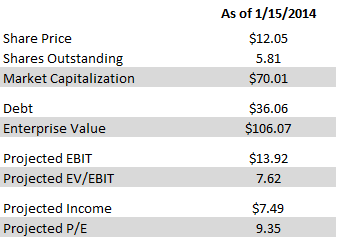 Based on $4.5 billion in assets the current run rate is $1.25 to $1.30 per share in reported earnings and $1.52 to $1.63 per share in cash earnings. Hennessy began trading on the Nasdaq today.